Like it? Pin it on your Pinterest board! One of my favorite countries in South America for food is Peru. If you’ve been to Peru, you already know why I love it so much. The flavors are unique and bold, the seafood is fresh and they love their fried foods! Peruvian food is a blend of traditional indigenous foods, like corn and potatoes, along with flavor influences from immigrants arriving from Europe (Spanish, Italian and German). Of course, being located on the sea, one of Peru’s main staples is fish and it is used in abundance in Peruvian cooking. The best part about eating in Peru is that there are so many celebrated dishes and beloved foods. I could make a list of 100 foods you must eat in Peru and all of them would be incredible displays of the wonders of Peruvian food. I’ve settled on my top 12 essential foods to try in Peru foods that I think every traveler to Peru should seek out. These are a mix of the most iconic dishes and my own personal favorites. It won’t be hard to find any of these and food is very reasonably priced in Peru, so eat up and enjoy! Chicharrones de Calamari is deep fried squid. It’s often served in large quantity with a relish made of red onion an lime juice over the top. While you can, and many people do, eat this as a main dish for lunch or dinner, it’s most often eaten as a snack or appetizer. The term Chicharrones isn’t limited to just calamari. In Peru, chicharrones can be made of fried pork belly, chicken, beef or pork rinds. It’s really more about the fried aspect than what it is being fried. This dish is very popular in Peru and you can find it on many restaurant menus throughout the country. 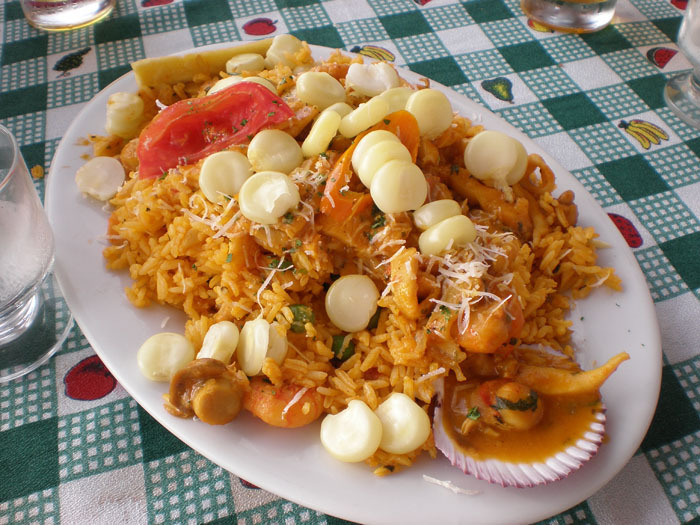 Rice is fried up with an aji amarillo pepper, a tomato base, some onions, mushrooms and plenty of fresh seafood, like shrimp, squid and scallops. The variations are vast, but no matter what seafood is used, you’ll end up with a huge plate of food to devour. I love it when they add big corn on top, too! These skewers of grilled, marinated meat resemble shish kebabs are served everywhere in Peru. High-end restaurants offer them as entradas, or appetizers. Street-cart vendors sell them slathered in a garlicky sauce. While almost any meat can be prepared this way, the most traditional – and best, in my opinion – are made with beef heart. I wasn’t so sure the first time I tried it, but it’s undeniably good and cheap too! Leche de Tigre is the citrus juice that’s leftover from curing the raw fish for ceviche. It’s a delicious mix of lime juice, onion, spicy chilies and fish juice. This incredible juice is served mostly as an appetizer in a tall glass with a couple of prawns thrown in. I fell in love with Leche de Tigre when a Peruvian friend of mine took me to a hole in the wall Peruvian restaurant to try it. It is a flavor bomb that will alight your tastebuds in the best possible way, and it’s super spicy, with just a hint of fish flavor. There’s nothing else like it. If you like ceviche, you’ll love Leche de Tigre. I couldn’t get enough of it while I was in Peru and I’ve even tried to make it a couple of times at home. You might be a little turned off by this one, especially if you ever raised one of these little creatures as a pet. Guinea pig, known as Cuy in Peru, is a staple meat of the Andes and it can be found in many restaurants, especially in and around Cusco. The meat, which is quite bony, is usually baked or barbecued on a spit and served whole—often with the head on. If you can get over the fact that its a guinea pig, you’ll find it similar to rabbit or quail. Tastes like chicken, just like everything else. Speaking of immigrant’s influence on Peruvian food, the dish Lomo Saltado is a prime representation. When Chinese immigrants arrived in Peru, the ingredients and techniques they added to Peru’s cuisine left a lasting impression. Lomo Saltado is a stir-fry, in which beef, tomatoes, peppers, and onions are blended in a pan with soy sauce and fried potatoes, then served on a bed of white rice. If you like this dish, try eating at a Chifa restaurant in Peru, where Chinese-Peruvian fusion really comes to life. From the first time I tried it in Peru, I have been completely crazy about Choclo. I affectionately refer to it as Big Corn, because… well, it’s BIG! I’ve never seen it anywhere else, but this giant form of corn, known as choclo or Cuzco corn, can be found all over Peru in many forms. In addition to being oversized, the corn is known for being chewier, nuttier and less sweet than other types of sweet corn. I once almost got kicked off a train for reaching out the window to buy an ear of big corn from a vendor outside. It’s that good. If you’re thinking the churros in Peru are probably the same as they are in other parts of the world, like Spain, you’re wrong. Peru has the best churros in the world. They are big and fluffy, crunchy and sugary on the outside, and often filled with dulce de leche in the center, then served with various dipping sauces, like dark chocolate or marmalade. You can buy them in fancy dessert shops, from street vendors or alongside a fancy dinner at a restaurant. Everyone loves churros in Peru and as soon as you sink your teeth into your first one, you’ll see why. Basically a croquette of a different name, a Papa Rellena is made by stuffing a seasoned beef mixture into a pocket of mashed potato that is then breaded and fried. It’s very similar to other croquettes made around the world and we love those, so of course we love these as well. We call it ceviche, but it’s actually called cebiche in Peru. This is probably the most iconic dish in the country, and there are dozens of versions and ways to make it. The more traditional and most likely to be found on restaurant menus are fish cebiche, cebiche mixto, black scallops ceviche, shrimp ceviche in Arequipa, ceviche of guitar, also called Lambayeque chinguirito, ceviche nikkei and Amazon ceviche. My favorite is cebiche mixto, which features many different kinds of fish and shellfish and is a great way to get a taste for many of the different types of seafood eaten in Peru. A very popular Peruvian dish that is served around the coutnry, but especially in Arequipa where there was a large Spanish influence on cuisine, a Rocoto Relleno is a stuffed pepper. Hard-boiled eggs are placed inside the pepper and is then topped with melted cheese, baked and served whole. Variations include meat, onions, peanuts, milk and eggs, potatoes and cheese. No matter what’s stuffed inside, once the pepper is baked it sets off delicious aromas that are hard to resist. If you travel to Cusco or another high-elevation destination in Peru, you’ll quickly be introduced to Coca tea and it will become your best friend for the few days it takes your body to acclimate to the new altitude. Coca tea is an herbal tea made by steeping raw leaves from the coca plant. The leaves of the coca plant contain alkaloids which are the source of cocaine. However, the amount of coca alkaloid in the raw leaves is small. It is often used as a way for travelers to recover from altitude sickness, though there isn’t much scientific proof that it actually helps. You might find otherwise when your head is pounding and feels like it’s about to burst from pressure. Another favorite drink in Peru is a Pisco sour. Made with Peruvian pisco as the base liquor, a Pisco sour also includes Key lime or lemon juice, syrup, ice, egg white, and Angostura bitters. The ingredients are mixed up over ice then served with frothy egg whites on the top. We like to make these at home when we’re feeling nostalgic for Peruvian food and drink. The cocktail is both sour and sweet – a perfect combination! Have you been to Peru? If so, I’m sure you have a favorite dish or two you tried while you were there. Tell us about your favorite thing to eat in Peru in the comments. This entry was posted in Best Of, Food and tagged food, Peru. Love each and every dish you described! I’m in Ecuador, just left Peru behind and I miss its food already! =) Great post! Lucky you! I would love to be in Ecuador right now. Is the food there as good as in Peru? Loving all the seafood but I really don’t think I could try Leche De Tigre – no matter how cute it’s presented. Feel sick just thinking about it! Maybe it’s the description that doesn’t sound appealing? It’s really just ceviche in a different form. If you like ceviche, you’ll definitely like leche de tigre. It’s really good. I have been to Peru twice. I will go again. And I am never ever ever trying cuy. Haha, I can see why you’d say that, Claudia. It’s not the most appetizing of the dishes you can get there. You already got me hooked at the first photo. Yum!!!! It’s been my dream to backpack across South America for a few months, this definitely inspired me to make that trip happen some time soon. Great blog! Thank Karla. I was hooked on Peruvian food with the first dish I ordered. A backpacking trip across South America would have incredible. Imagine all the delicious food you’d come across! Oh no, Christine! The Leche de Tigre is amazing. I loved it so much, I tried to make it at home. I promise it’s not as strange as it sounds – if you like seafood, that is. You should mention that Peruvians never have Cevuche at night which is only for tourists. This ensures that the fish is fresh. Also one should try Matsuei Restaurant in Lima which is where Nobu’s cuisine originated. It is a great fusion of Peruvian and Japanese cuisines. Two very great points, Sanjay! Thank you. I’ll remember not to eat ceviche at night, and I’ll definitely check out Matsuei next time I’m in Lima! Yum. I’d totally be GAME for trying Guinea Pig! See, that’s the right attitude! Peru has amazing traditional dishes such as ceviche. These flavors are still on my mouth after trying them. And the incredible thing is that there are several ways to prepare this dish! like 3 ways or more, depending in what part of Peru you are. I do love Peruvian ceviche. It’s the best in the world.